Visitors to Shanghai find a city with two personalities—the ancient and the modern—and most travelers need to book two or more tours to experience both. 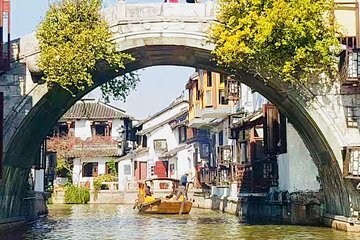 Avoid the hassle with this two-in-one private tour experience—see the ancient water town of Zhujiajiao in the morning, and explore contemporary Shanghai's most celebrated city sights in the afternoon. To get the most out of your tour, enjoy a flexible itinerary, restaurant lunch, and personal guide included.